If you’re in Christmas denial like me, there’s one thing that might help you get into the festive spirit – beer advent calendars. I was reminded recently there were 100 days to go. Urgh. I like Christmas, but starting the countdown in September makes me a bit bah-humbug…it’s just too early. 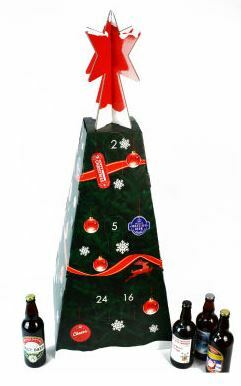 Unlike many of the other beer advent calendars out there this one features cans rather than bottles. It’s a classy-looking ale hamper with an array of craft beers hidden behind funky snowflakes. You’ll find IPAs, pilsners, pale ales, porters/stouts amongst others but the makers of this calendar are keeping the exact contents a secret so as not to ruin the surprise. But they do give you a heads-up on what breweries to expect, naming a few as Anchor, Beavertown, Brewdog, Brooklyn, Vedett and Vocation, so it’s unlikely to disappoint. You even get a commemorative stemmed glass with it too. It also features a cool infographic on the back that walks you through the brewing process. 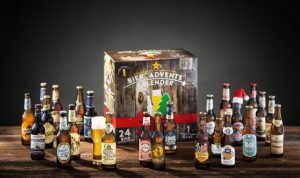 This one’s meant to sell for £75 but this is the company’s first year of selling a beer advent calendar so they’re offering it for an ultra-competitive pre-order price of £55. If it’s variety you’re looking for this bevvy of beauties promises exactly that. It features beer from 23 different breweries. Every day brings something new with 17 beer styles, so whether you love your lager or like to sip a saison there’s something for you. You get to explore the globe with beers from seven countries over four continents. And if that’s not enough to entice you, it also promises four exclusive beers you won’t find anywhere else. Its RRP is £75 but early birds who pre-order can bag it for £65 and get a £10 beer voucher thrown in. This boozy Christmas tree aims to bring out your inner child, but promises something more exciting than a wafer-thin chocolate on the other side of the door. It comes fully assembled except for the star (but putting the star on top is half the fun of putting up a tree right?) and features British beers of various styles and strengths. It claims to be the ‘only beer Christmas tree in the world’ and would make a pretty impressive addition to any beer-lover’s Christmas decorations. My curiosity is piqued by the fact it features a “surprise” in the tree trunk to go with your Christmas dinner. I want to buy it just to find out what’s in there! You can tree-t yourself to this one for £75. 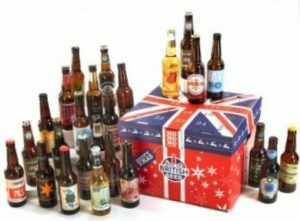 If you love craft beer you’ll love this mystery box of 25 British beers. It features a mix of beer types from 25 independent breweries, with classic and modern styles and the picture gives you a bit of a sneak-peek at what to expect. This one might look a little less festive than some of this year’s other beer calendar offerings (the big kid in me likes to see cheesy Christmas baubles and other borderline-tacky festive cheese!) but its design pays homage to the origins of the tempting home-grow contents inside. And as you start popping open the doors every day it’s not going to take long to get into the festive spirit! This one is £69.95 and delivery is to UK mainland only. I’ve saved the best for last, in my opinion anyway! This calendar has me especially excited as it features a damn good selection of German quality beers that range from 4.4% up to a strong 8.1%. 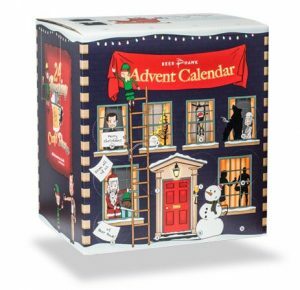 I particularly like the fact you get a list of what’s inside, which you don’t get with most of the others beer advent calendars on sale. Okay, this takes away the element of surprise, but it also reduces the risk of buying a stack of beer you might not love. You even get some lovely little extras – a tasting glass and a beer tasting folder – so you can truly savour this beer experience. Brilliant. It costs £58.99 on Groupon and if you’re new to the site you can also take advantage of a discount code to get an extra 15% off when you sign up, and it also retails at £58.99 on Amazon. 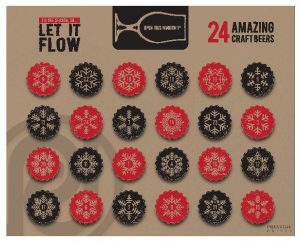 I should mention that Kalea has produced not one but but FOUR different beer advent calendars this year – the one shown is the Classic Version, but there’s also the Bad Santa Version, Craft Version and Cans Version. So if the one you want sells fast – and I’ve no doubt they will – don’t be disappointed, shop about on both Groupon and Amazon and keep your eyes peeled for the other variations. I’ll leave you with a video of the making of this cool calendar. Images used with kind permission of all featured retailers.